Fall in the Pacific NorthWest means the return to foggy mornings, and rain drizzled days. Autumn sunsets let us bask and savor those last few sun rays as the days get shorter. We are winding down from the eventful summer and getting cozy as we prepare for the winter storm season. Here are some of our favorite fall recipes to keep you warm on those crisp days as the seasons turn. 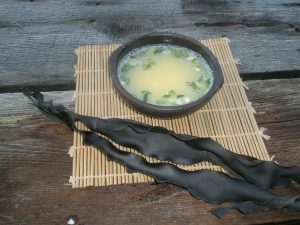 Soak four 4″ square pieces of dried Kombu in about 4 cups of water for an hour. Bring slowly to a boil and then remove the Kombu. This soup can be enjoyed as is or tofu pieces, sesame seeds and sliced green onion can be added. Combine first 5 ingredients and heat to boiling. Stir beaten egg into soup. Ladle into bowls. Garnish with green onions. Blend flour and kelp flakes in large bowl. Cut together with pastry blender or your fingers to form fine crumbs with the flour, butter and salt. Make a well in the center of the blended mixture. Add lightly beaten eggs and yolks to the well. Using a fork gradually mix flour mixture into the eggs and continue to mix until the dough comes together. Divide the dough into quarters. Start rolling out a piece of the dough with a rolling pin, stretching it a little more with each roll. Between each rolling and stretching, continue to sprinkle it with flour to keep it from sticking. Repeat this procedure until the dough is paper thin and translucent. Repeat with remaining dough. Let the dough dry on a pasta rack or makeshift dowel for about 20 minutes. Avoid drying noodles too much. Roll the noodle sheets up and cut the desired width. The noodle dough can also be rolled and cut with a hand cranked pasta machine. Cook in boiling water. Store unused noodles in an airtight container in refrigerator. These recipes, and many more, can be found in Pacific Seaweeds and Exploring Kelp: The Kombo Story, available in our Gift Shop! 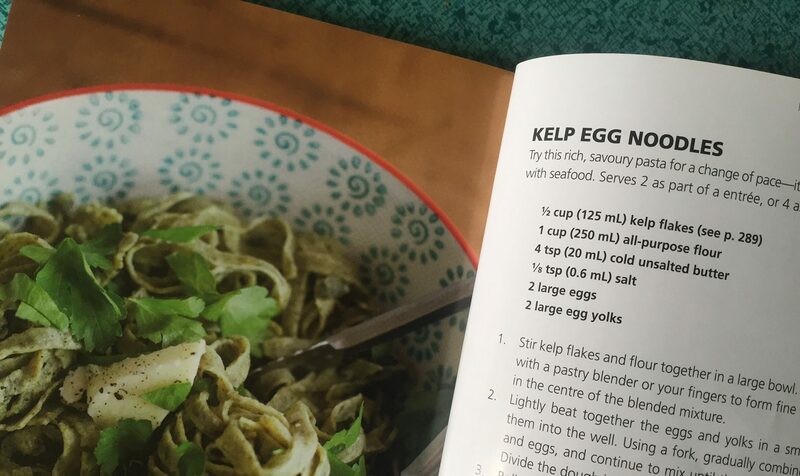 If you have a favorite kelp recipe to share, contact us. We would love to hear from you, and your recipe may be featured on our blog!